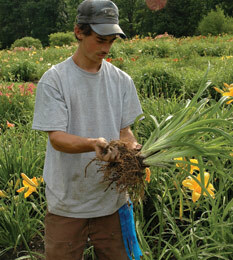 The whole process of preparing daylilies from growing to shipping is a small family hands on process. Each plant is carefully dug, tagged, washed, cut and packed by hand. 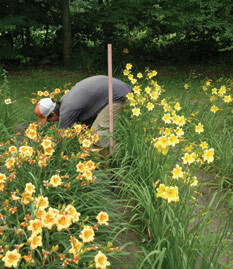 David divides clumps of daylilies, preparing them for rowing out. The daylilies we grow are planted in freshly tilled heavy-composted soil. 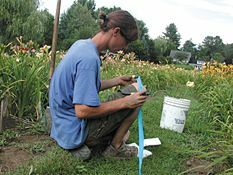 Jasper selects a daylily from several rows of miniature cultivars. After selecting a plant suitable for digging, Jasper carefully digs and divides a saleable size piece on the spot. Our daylily tags are simple but they are easy to read and wont rot or washoff before they get to their destination. Next the daylilies are cut back. This may seem detrimental but we always cut our daylilies back when we transplant them and it makes shipping easier and cheaper (for everyone). Finally the daylilies are individually washed. By removing most of the soil we further reduce the weight and ensure a clean healthy plant. The washing also helps to thoroughly moisten the plants before shipping. Lastly the plants go into their shipping box. The daylilies are carefully placed between layers of paper. This helps keep them moist but also allows for some air movement reducing molding. We always are sure to get plants dug, labeled, washed and packed quickly. Plants are generally out of the ground for only part of a day before being packed for shipping. Plants are shipped out the afternoon of the same day they are dug.